At the convergence of four different major wine growing regions, Healdsburg can be considered Wine City USA. And yes, none of those wine regions are known as the Napa Valley. It is at this not-so-quaint feeling quaint town where the Alexander Valley to the north, the Dry Creek Valley to the west, the Russian River Valley to the south, and the Sonoma Valley to the east/south east (really the Sonoma Valley is further south of Healdsburg, but the Chalk Hill and Knights Valley appellations are often considered part of the Sonoma Valley). None of these region boasts the fame and the tourist traffic of next door Napa to the east. At least not yet. And that’s a good thing as Martha would say. This is prime zinfandel territory, with some of the country’s premier renditions coming from the likes of Unti and Forchini. Further west is the Sonoma Coast, the prime Pinot Noir rivals to the Willamette Valley and Santa Ynez Valley. I’d call a draw between Skewis Pinot Noir of the Sonoma Coast and Penner-Ash up north in the Willamette for the year’s most impressive Pinot Noir. So of course, there is good wine to be found at the vineyards all around Healdsburg. There is also plenty of excellent wine, both local and from beyond, to be found right in the center of town, along with a shockingly high number of wonderful places to eat for a town of barely 11,000. It almost seems like there is one restaurant or winery for each of the town’s residents. The closest comparison for Healdsburg would be Yountville over in the Napa Valley. Both are tiny towns with a beyond enviable population of high caliber restaurants. Yountville has The French Laundry and Thomas Keller’s other restaurants. Healdsburg has Douglas Keane’s imaginative luxurious cooking at Cyrus (for the moment…that may end very soon due to a landlord issue). Yountville has Bouchon Bakery. 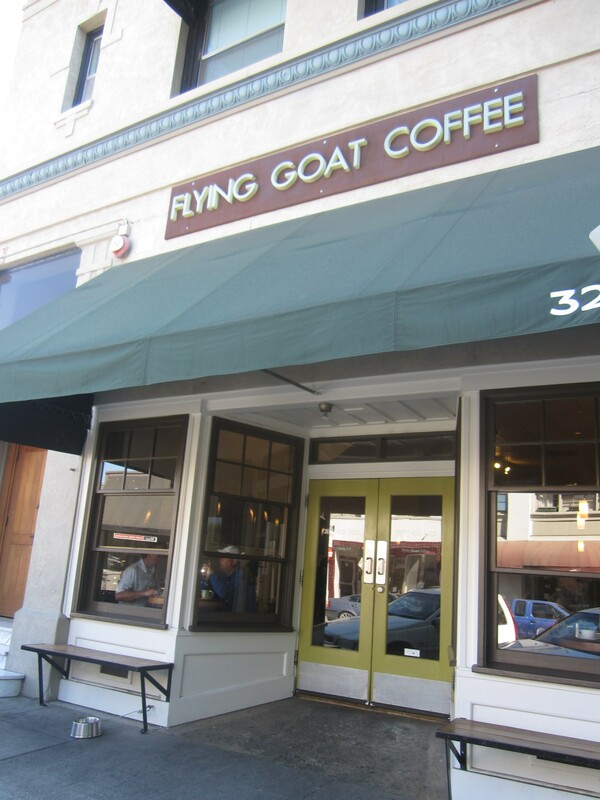 Healdsburg has the Downtown Bakery & Creamery, along with Flying Goat Coffee. Yountville boasts Bottega from Michael Chiarello. Healdsburg is home to Scopa and Scopa’s little sister, Campo Fino. Both towns obviously are focused on the food and wine industry and the discerning palates of the tourist crowds the industry draws. Yountville has more of a classic, rustic small town feel, while Healdsburg certainly strikes you with its recent glossy re-model juxtaposed to the older sleepy days. Does Yountville have a central plaza or destination worthy craft cocktail bar or Yucatan restaurant? How about one of the country’s top craft breweries? No. Healdsburg does. And it all focuses on the central plaza in Healdsburg. The plaza is the focal point for everything from parking to picnics to orienting yourself in the city. By day, it’s where the tourists and locals sip coffee in the sun and day workers stand at the corners looking for work. At night, the bars and restaurants surrounding the plaza come alive, while the plaza itself becomes pristinely quiet, a particularly joyful place for a sunset stroll. The culinary and tourism renaissance of Healdsburg can almost certainly be credited to Cyrus, a Michelin Two Star and San Francisco Chronicle four star gastronomic destination. Chef Douglas Keane and maître d’ Nick Peyton opened Cyrus five years ago in the equally impressive Hotel Les Mars, just off the plaza on North Street. The eight course tasting menu and five course tasting menu include creations such as Thai lobster with melon and avocado and Australian Wagyu beef with mung sprouts, fermented black beans, and kumquats, along with Nicole Plue’s extraordinary desserts (think yuzu crémeux, bergamot meringue, and cream cheese ice cream). Even if you don’t want to drop $135 or $108 for the tasting menus, you can enjoy the same dishes à la carte in the front bar first come, first served, along with some dashing cocktails. 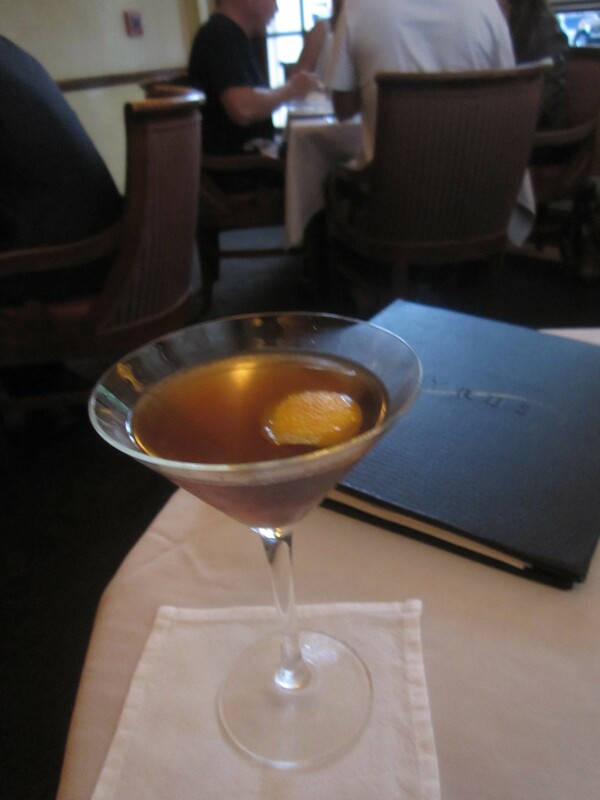 Don’t miss the “Boulevardier,” a 6 month aged Bourbon variation on the Negroni. 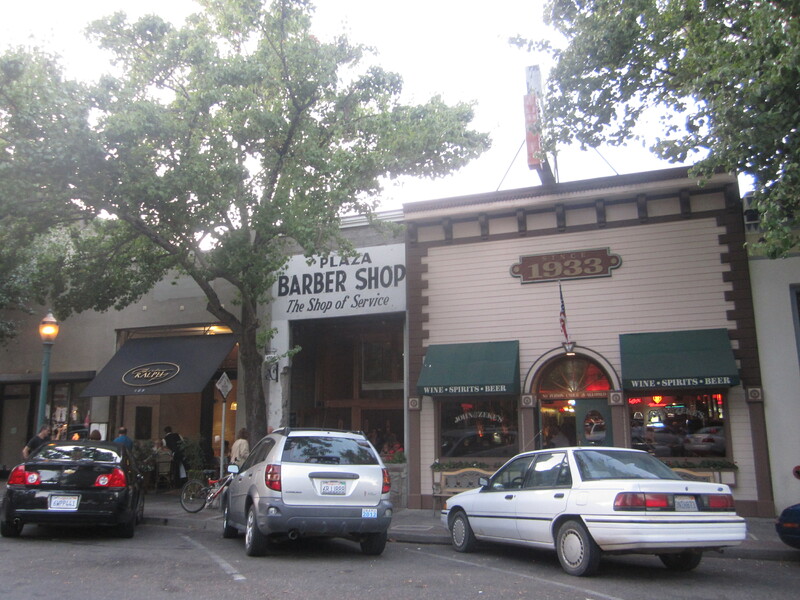 Healdsburg Avenue is the main thoroughfare for Healdsburg, running along the west side of the plaza. At North and Healdsburg Ave. is Willi’s Seafood Bar, an always popular spot for innovative seafood small plates from Mark and Terri Stark. Along Healdsburg Ave. heading south you’ll find Baci Cafe, the terrific cupcakes and Four Barrel coffee at the Moustache Bakery, a terrific European wine list (!) and beer list at red hot nightlife spot, husband and wife run Bergamot Alley, and the new restaurant from the ever popular Scopa, Campo Fino. 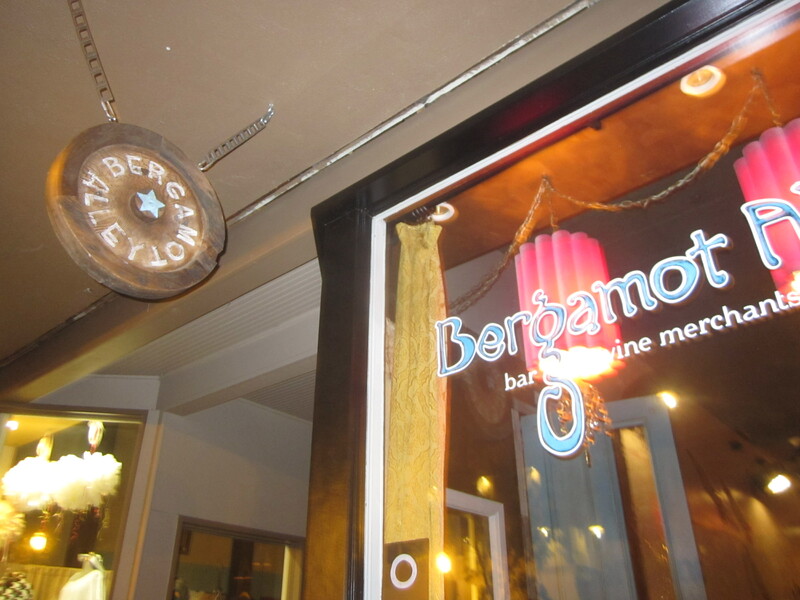 I dare you to resist playing bocce at Campo Fino or dancing after a glass of Arneis from the Jura at Bergamot Alley. Great times are to be had at both places by all. 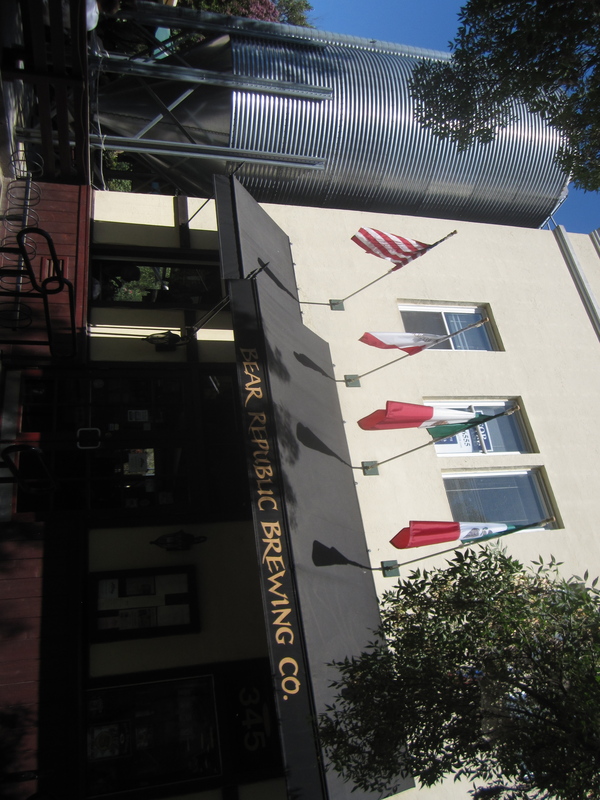 Mixed among upscale clothing boutiques are Kendall Jackson’s tasting room and on a little pedestrian mall, the Bear Republic Brewpub. Obviously beer, not wine or food are the focus here, with the Cafe 15 Double IPA, Tartare Sour, and Hop Rod Rye IPA receiving top honors at my tasting. Skip the food, there’s far too much worthwhile eating to do in this town to dine here. At the plaza’s southwest corner are celebrity chef Charlie Palmer’s Dry Creek Kitchen inside the Hotel Healdsburg and the Healdsburg Bar and Grill, home to the town’s finest outdoor patio arguably. Continuing the block south away from the plaza, you’ll find the Stephen & Walker tasting room and superb Yucatan cooking from former dishwasher at Masa’s in San Francisco and chef de cuisine at Dry Creek Kitchen Mateo Granados at Mateo’s Cocina Latina. 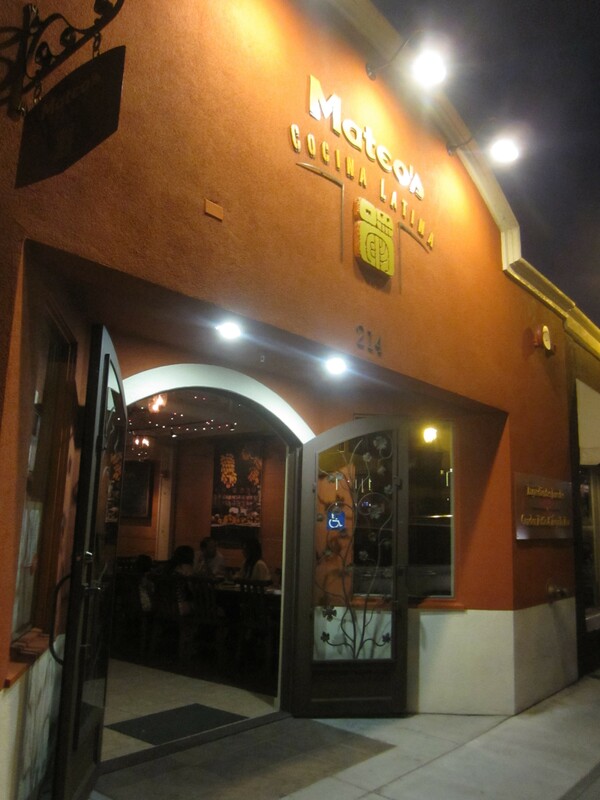 The restaurant was mostly empty the night of my visit unfortunately and the Margarita with Mezcal lacked any depth. However, Granados’ heart and talent for his native Yucatan cooking is ever apparent in the superb tamale filled with robust suckling pig and topped with a powerful cinnamon laced sauce. His lighter touch is brilliant with an heirloom tomato and figs salad and yes, go for the adobo marinated chicken as a taco filling. The Yucatan slow roasted suckling pig Cochinita Pibil is the specialty. It’s too bad the crowds aren’t packing the house, the local monkey faced eel was a touch on the fishy, distracting side, and desserts are an afterthought. At least you can get an ice cream cone…called a “tacone.” It’s a brilliant creation of crispy corn tortilla cones filled with some mighty fine olive oil guacamole. Across the street is craft cocktail central at the environmentally savvy Hotel H2’s Spoon Bar. 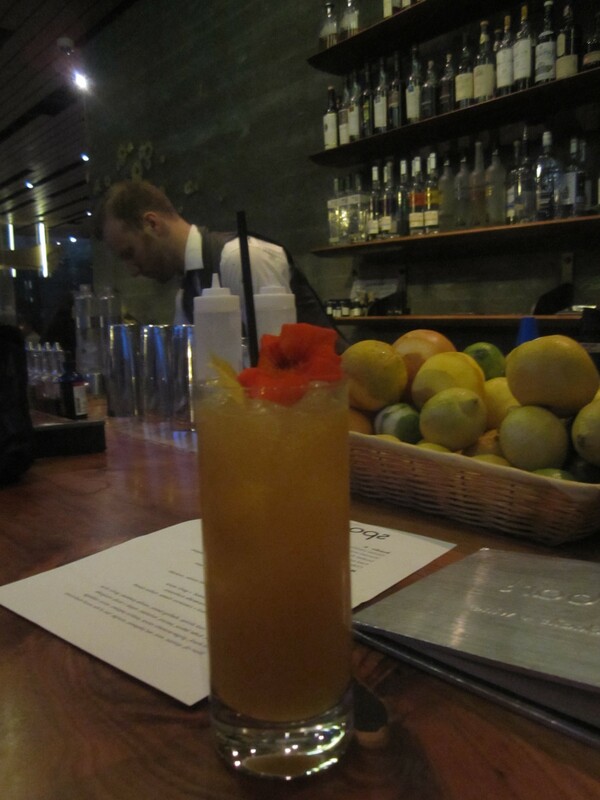 Carbonated cocktails have received much acclaim here and I can’t say anything but superlatives for the “Carbonated Sidewinder’s Fang,” with two types of rum, orange, lime, passion fruit, and garnished with a flower. The entire bar is one impressive garden. The cuisine from former Aziza chef de cuisine Louis Maldonado draws raves as well. The south side of the plaza is somewhat quieter leading to the ever popular Napa Valley favorite Oakville Grocery. Further south on Center Street is the restaurant bar Barndiva and anchoring the east side of the plaza is breakfast/brunch central, Downtown Bakery & Creamery. Lines here are inevitable. Go for the sticky bun of your dreams and a delightful peach galette. 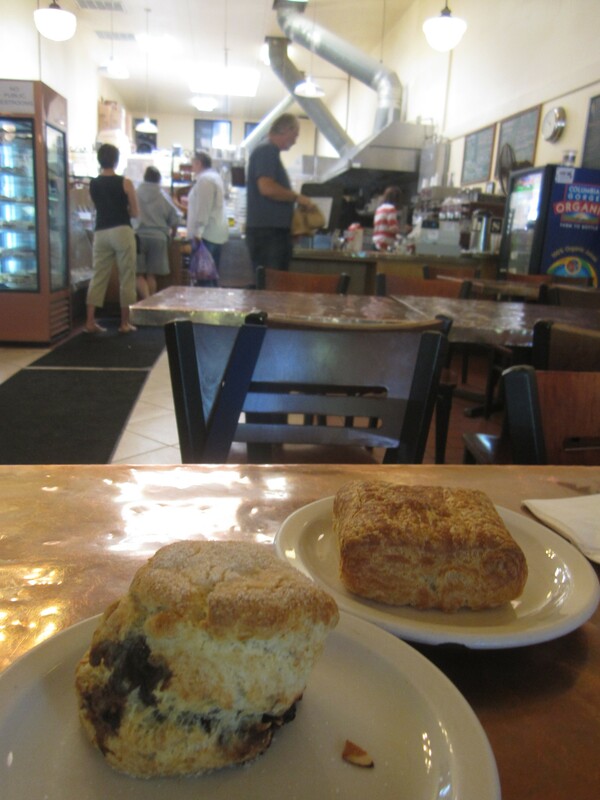 Scones and pain au chocolat needed more butter and blueberries/chocolate. At the northeast corner of the plaza are Powell’s Sweet Shop, superb espresso at Flying Goat Coffee (roasted in nearby Santa Rosa), and the handsome California cuisine at Zin Wine Bar and Restaurant. The last stretch of our virtual walking tour of the plaza, along the north side on Plaza St., may be the most impressive yet. Upscale lunch spot extraordinaire Bistro Ralph is where you go when you want to taste wine in the afternoon with chef driven cuisine. When it’s time to for a grand old time worlds away from formal wine tasting, the local “dive bar is” nearby John & Zeke’s. Next door is the certainly not divey tasting room for Ferrari-Carano, which can’t compare with its main Italian palazzo tasting room in Dry Creek Valley. 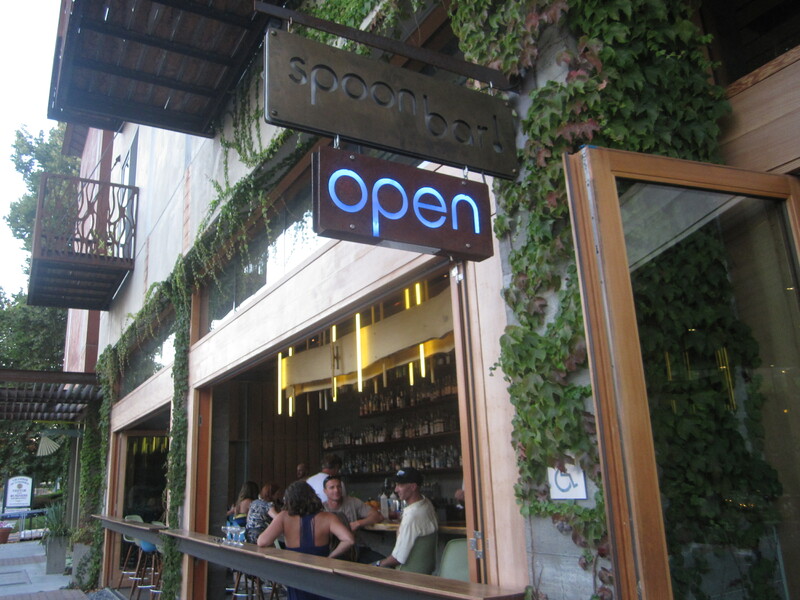 But the pinnacle of Healdsburg is the crammed dining room of Scopa (look for the barber shop sign!). Opened four years ago by Ari and Dawnelise Rosen, Scopa cannot possibly be more than six feet wide, as narrow as a tight rope. Somehow with the close confines and exposed brick walls that transport you away from Healdsburg to Trastevere, you can actually have a conversation. That is, if you aren’t savoring the phenomenal rustic, yet fresh Italian cuisine. 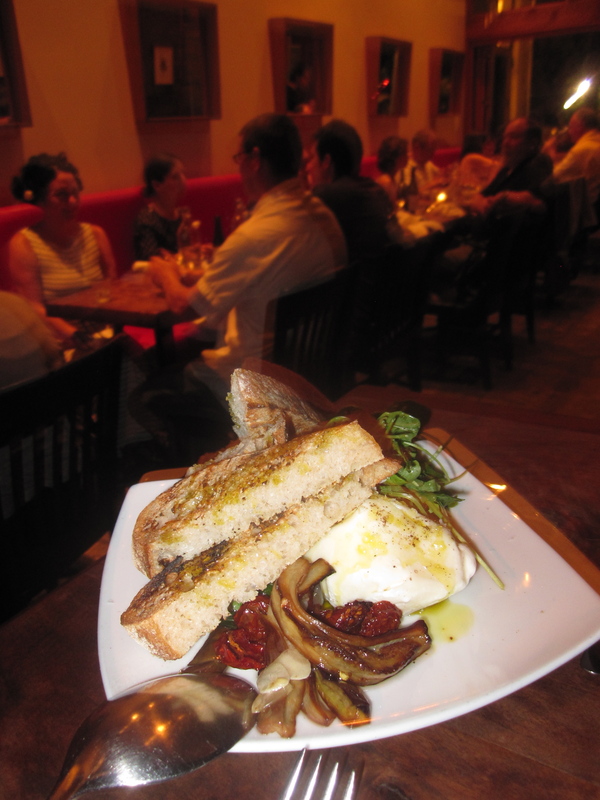 Luscious burrata on olive oil slicked grilled bread. A warm corn budino with leeks, chantarelles, and parmigiano made me briefly shiver. Pizzas, sugo calabrese over spaghettini, and even the requisite meatballs are elevated to the heights you always hope for and seldom see from a trattoria. What’s best? I can’t stop talking about how a pair of simple dishes can be so transcendent. Peaches should always be grilled if they appear like Scopa’s with arugula, shallots, and a white balsamic drizzle. The impossibly homey, not aesthetically handsome Nonna’s tomato-braised chicken is the house specialty and deservedly so. The tenderest, moist chicken and soft polenta work in tandem here as effortlessly Walsh and May-Treanor. Wonderfully warm service, extremely lemon heavy water that borders on unsweetened lemonade, and excellent desserts (you’ll be getting the seasonal fruit panna cotta and Sicilian flourless chocolate cake) from Ari’s father Norm complete the perfect neighborhood Italian restaurant. This entry was posted on September 10, 2012 by trevsbistro. It was filed under CA, Healdsburg, Neighborhood of the Week .